Haunteon. This is my Ghost-Type version of an Eeveelution. This is hand drawn, and edited with paint.NET. PLEASE do not critisize my artwork, I'm a 12 год old self taught artist. DON'T JUDGE ME. This is also on my deviantART, Имя пользователя TypeAPsychoticCrazie.. Wallpaper and background images in the Eevee Evolutions Clan club tagged: eeveelution haunteon pokemon ghost. This Eevee Evolutions Clan fan art might contain аниме, комиксы, манга, анимационные фильмы, комикс, мультфильм, and книга комиксов. its cool! 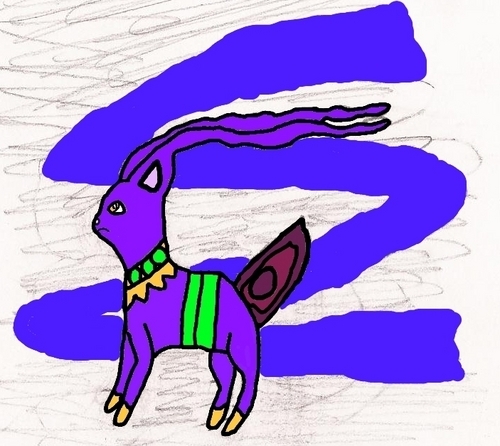 im 11 and i made a new eeveelution--arceon!